All packages include a dedicated Alert function, Phone, SMS-chat and text email. Vessel Monitoring is enhanced with data compression, offering 5-minute tracking resolution—a significant upgrade from 30-60 min reporting via legacy VMS. In select markets, we offer an integrated electronic logbook: providing a single, streamlined data entry process for reporting of catch to the company, national and transnational (RFMO) regulators. No more rekeying of data into multiple systems. Provide voice, email, and SMS-chat capabilities to crew members (separately billed). Quotas and time of-day restrictions may be specified. Virtual Observer camera technology monitors on-board activity with configurations from 1 to 6 cameras. The latest generation of video codecs maximizes resolution and reduces data-transfer costs. Our wireless sensor technology detects changes in temperature, light, humidity and pressure, providing proof-of-quality indicators. Wireless mesh technology simplifies installation. Machine vision algorithms identify Critical Tracking Events (CTEs)—such as catch being brought onboard—then store optimized video and sensor data. Satellite (offshore) and cellular (near-shore) links provide cost-effective real-time data, with lowest-cost routing. 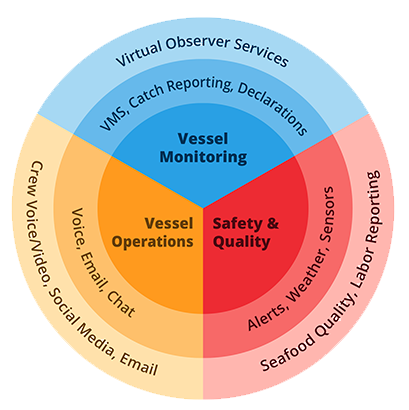 Offers substantial benefits for crew members, providing access to social media, email and voice services while at-sea. 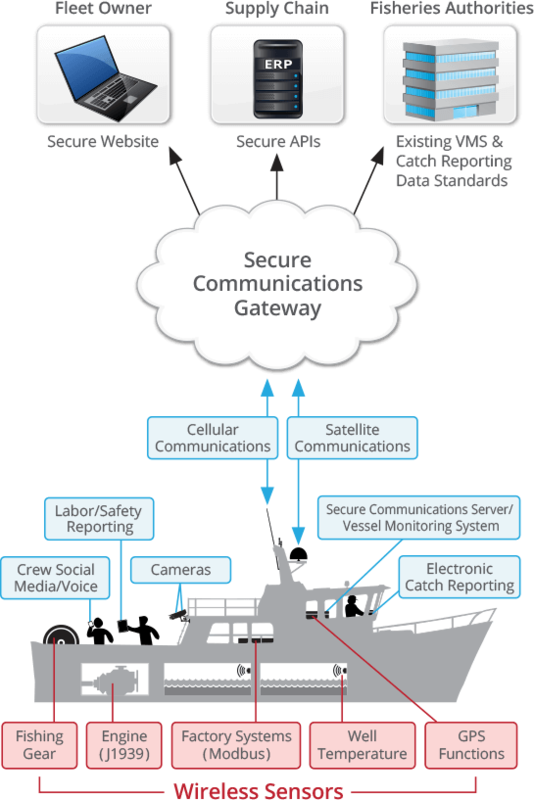 Communications packages tailored for small, mid and large scale fishing vessels—with industry leading price/performance. Realtime visibility with Video Monitoring, Catch Reporting and GPS Tracking. Satellite Optimized Email, Voice and Internet services. Monitor product temperature and working conditions.